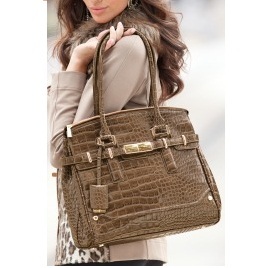 Roomy zip-top handbag in Croco print with belt and luggage-tag details. Sturdy footed bottom. Interior zip and slip pockets in jacquard-print lining. • 14” x 4 1/2” x 11 1/2”H.